... I am writing a piece of fiction set in 1880. Part of the story involves characters riding a passenger train from Denver to Kansas City. I am looking for information about what that would have been like (as a passenger) to provide atmosphere for the story. 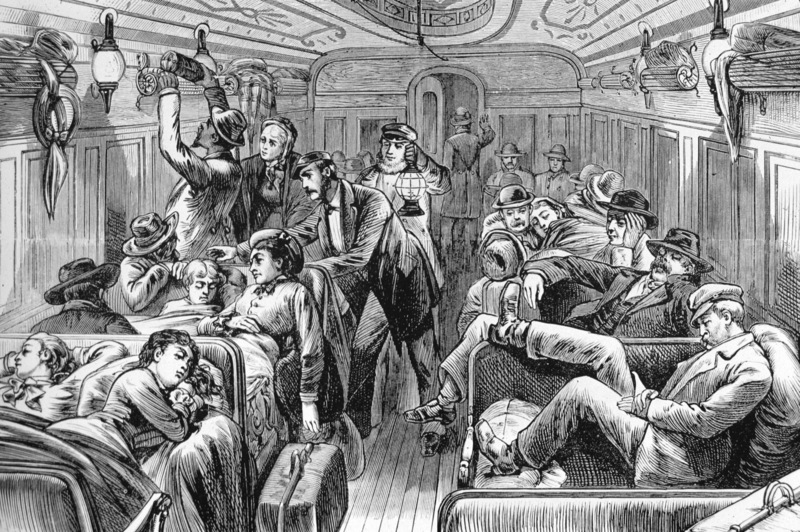 Most of the information I have been able to find online discuss the history of building railways without much in the way of what the passenger experience would have been like. Any information you can provide or can point me to would be greatly appreciated. How long would the journey have taken? How many stops would it have made? How many cars were on a typical train? What was the typcial composition (i.e., number of passenger / sleeping / dining / cargo / other cars and in what order would they have been strung together?). What kind of food would have been available on the train (or did people get off at certain stops to eat instead)? Were there bathrooms on the train? What were they like? How big were the different kinds of cars and how were they laid out? What kinds of security precautions were taken (were there security guards on trains)? Leslie's Illustrated Newspaper 02-09-1878, p. 389.